Being a leader in the industry, we are engaged in offering a qualitative range of Neem Herbal Pesticide as per requirement. Effective against wide range of pests. Neem Pesticide acts in various ways like as anti-feedant, as repellent, as growth inhibitor and also has ovi-position deterrent effect. Neemon is a natural bio organic insecticide product extract from Neem seed kernel based 1500 PPM with water solvency. - Control on pest: white fly, bollworm, Trips, storms borer brown plant hopper and leaf folders on paddy. Neem-based pesticide effective against more than 300 species of pests. Neem-based pesticide. Neem contains a complete array of bitter constituents known as meliacin of which Azadirachtin is considered the most potent in its pesticidal properties. It is effective against more than 300 species of pests in agriculture, horticulture, forestry and plantations. Available in concentrations of 300 ppm (0.03%) and 1500 ppm (0.15%) in 1litre, 500 ml and 250 ml packing. 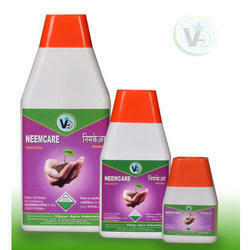 We are the Industrial Leading supplier of Neemox Neem Pesticide. Insects cause major damage especially to high yielding varieties of crops. Necessary to reduce insect damage but if we can do so without use of toxic products, it is environmentally ideal. Value Regain is an wonderful product that caters to diverse nature of virus and bacterial related diseases to the plant. as 0.03% Emulsifiable Concentrate (300 ppm).